What is Tripping? What Does Tripping Do to Your Brain? What Does that Experience Mean? Tripping is slang “for having a psychedelic experience”. Tripping isn’t a drug, it is a state of mind that some psychedelic drugs let us access. This state of mind can be best visualized by looking at the data from a recent study on the effects of LSD on the mind. According to that 2016 study mentioned above, which we also discuss here, tripping seems to be the brain talking to itself and sharing data in a way that isn’t normally useful. It appears to be a process of repressing useful processes and connecting other ones, which don’t typically connect. A type of overactivity in the brain that leads to complex visual hallucinations. To quote a line from the study, “with a normal brain your visual cortex processes information taken in from the eyes. On LSD, many additional brain areas contribute to visual processing.” You can see a photo from the study below. Visual hallucination isn’t the only thing happening in the brain; other studies have shown impressive effects on mood, and a general feeling of having “realizations.” (See our page on the more science-y part of tripping. I want to convey what the experience is and what it is like without this page getting too long). It is my understanding that the “soul revealing temporary altered state of consciousness induced by the consumption of psychedelic drugs” (AKA tripping) is more akin to using a microscope or telescope than it is to putting on a VR headset or seeing David Copperfield perform optical illusions. Tripping is a vantage-point from which to see the world, not an illusion separate from a real world application. This becomes an important concept when realizing that most psychedelic drugs are illegal and nearly impossible for scientists to study. Below we muse a bit on what tripping means to help those who have no experience with the drug, or haven’t researched it, to understand this complex and taboo topic. Is LSD Really That Dangerous? One could say, “tripping is when you realize that everything and everyone is always tripping.” Although this is subjective, we can say tripping underlies what is normal and “normal” is just your brain filtering out the strangeness of reality and giving you useful information. The presenter from the YouTube channel PsychedSubstance explains tripping on different substances from a responsible viewpoint. This video talks about “what tripping feels like” (as in what do the visual, mood related, and physiological effects feel like). This Buzzfeed video claims “everyone in commercials is tripping on Acid.” In other words, essentially everything is “trippy” with the right pair of metaphorical glasses on (or when the brain decides to interconnect during meditation or an acid trip). Do you remember what it was like to be a kid? Ever have a fever? Ever awake in a dream state? Ever have an “ah, ha” moment? Ever laugh so hard you got light headed? Tripping is like a clear version of all those wrapped in one, and a little cartoony, comical, and nonsensical like a Terry Gilliam movie, although trips vary based on the person, the drug, and other factors. Real might not be the right term, but fake certainly isn’t either. When one takes LSD, it is hard to figure out what part is drug and what part is real, but it is pretty clear there is an underlying realness there… like when you have a few too many glasses of wine with friends and start in with the “real talk”. Perhaps, if we asked a Shaman, they would explain that psychedelic experiences are somewhat maddened states that reveal deeper truths about reality. It isn’t that the state is “real,” it is that some of what is being perceived seems to be. Movement is seen in plants, great realizations are had, deep emotional trauma dealt with, and once in a while, someone turns into a glass of orange juice. That one is a myth, but some people do have adverse effects. When we are young the world is a bit like a trip; our brains are unfocused and neurons connected almost non-sensibly. When we get older; our brains zero in only on what is useful. We don’t see our nose or glasses because it isn’t useful. Is this a trick or illusion? It is hard to say. The brain is an electro-chemical computer making composite images from sensory data. So without Descartes‘ logic, we have to accept on some level that what our brains show us on average is “real enough” to consider further (rather than dismiss). So then coffee, Pharma drugs, lack of sleep, concussion, alcohol alter states. They do not change reality, but they may distort it. Studies seem to point to LSD having a similar effect. 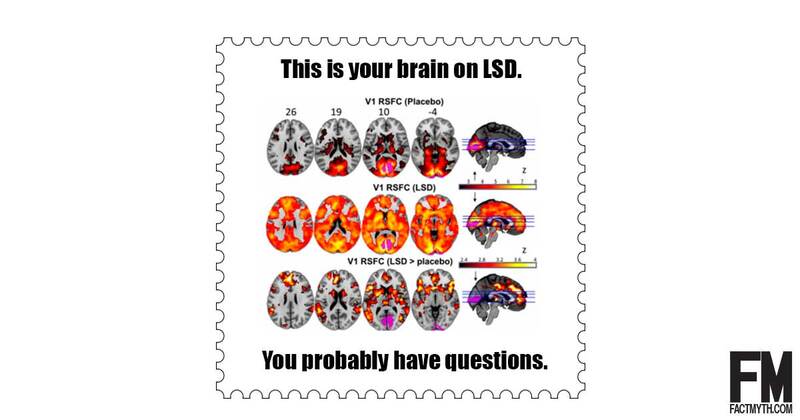 What Does LSD Do To Your Brain? – Brit Lab.